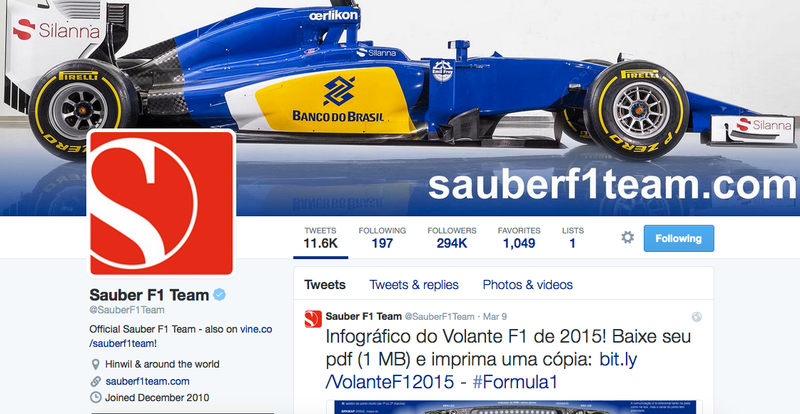 Sauber F1 Team on Twitter – driver line up to be confirmed! Keep on top of what’s happening in the world of F1 with our one-stop resource for all the F1 Team and Driver Twitter accounts. There is still a legal dispute going on between Geido van der Garde and Sauber, so we’re not sure of the exact line up. They may end up tossing a coin before every race weekend – thus far, it looks like the Dutchman is swapping out with Marcus Ericcson. The FVL blog will preview every race of the season prior to Sunday running, and holding competitions to guess the 1-2-3 on the podium. The full official F1 Race Calendar is available here. Subscribe now to get our F1 and blog updates by email, or via RSS. This entry was posted in Advice and Guides, Formula 1 and tagged #f1fvl, F1, formula 1, formula one by David Petherick. Bookmark the permalink.